I try not to compare male and female sports people. I tend to separate them for the purpose of 'greatest ever' arguments. I'm having difficulty trying to explain why; I guess it's just hard to measure. Personally I find Federer to be the far more accomplished tennis player. He's basically perfected every aspect of tennis - he's graceful and precise in everything he does from hitting clean winners off both wings, to deft defensive slices, to impeccable volleys off his toes, a great serve, and so on. Federer can beat you in many ways because he has all the tools. Serena however tends more to overwhelm her opponents with her power and superior physical attributes. And yet, she's won more Slams because she's much more of an outlier in the womens game with her power and athleticism giving her an overwhelming advantage over her opponents. So is Serena being that much better than her rivals - as opposed to Federer - that much due to her own greatness or because she has less comparative competition? I think it's more the latter. She had one truly great rival during her career - Justine Henin - but that's it. And for the record Serena wasn't nearly as dominant during this period. How would she have fared in terms of Grand Slam wins if she had to face 3 Henin's over the last 10 years (the equivalent of Djoker, Nadal, Murray)? I will say that Serena is the greatest sportswoman of all time though. Katie Ledecky is probably the other freak of an athelete that is on her level and may surpass her. Why is the thread titled the "The Best Sportsman To Ever Walk The Earth"? Either separate them into male and female categories or forget the whole deal. People here sprout on about male tennis players while back in 1973, Billy Jean King defeated a fellow American called Bobby Riggs in straight sets (best of five sets). He himself was a World (or co-world) No. 1, three times some time after WWII, so he was no slouch even though he was probably 20 years older. He also played Margaret Court earlier in that year and beat her best of two sets, I think. Would you think that Serena Williams would beat someone like Stefan Edberg or Pete Sampras? I'd like to put money on it if it ever eventuated. Meanwhile there have been numerous male vs female exhibition tennis matches starting back as far as 1888, however, usually with advantages for the female competitor. The ones after Bradman you literally could have 20. Slater is one of those absolutely. I tend to agree. For a sport I love so much, I consider Slater's 11 World Title Surfing Championships on the major feats in modern sporting history. The waves aren't controlled by humans - it is nature. There's no fast bowler trying to take your head off, nor is there a 125kg forward trying the same thing. Go for a paddle out to Teahupo'o (Tahiti) or Pipeline (Hawaii) and see what I mean. Not for the faint hearted. Try Australian squash player Heather Mackay - she won 16 back to back British Open in the 60s and 70s as well as two World Championships, 14 consecutive Australian Opens, over 45 years and 50s titles, one US Amateur, two US and five Canadian Racquetball Professional Championships, as representing Australia in Women's Hockey in 1967 and 1971. Cop that for a record! Usain Bolt. Because everyone on the planet knows if they were any good at running 100m. And if they were fast enough they stuck with it. Everything else is everyones second sport. whoever the best boxer ever is - Floyd Mayweather? Ewww, not Floyd. He spent his entire career avoiding champions in their prime. Bradman lolol... basically the Wilt Chamberlain of cricket. The numbers are great but he's nowhere near the 'greatest sportsman to ever walk the earth'. Nobody here has even seen him play aside from a few black and white highlights. This thread has given google one hell of a workout i see. Beyond these guys you have Gretzsky, Nicklaus, and the little appreciated Alexander Karelin whose record in wrestling is Bradman like. 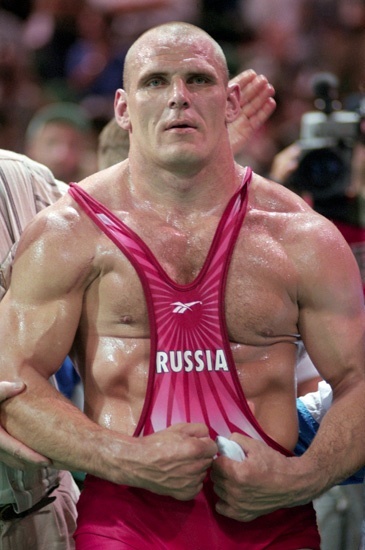 Glad someone else mentioned Karelin- absolute physical freak and one of the most incredibly dominant records in all of sport. And wrestling is a pretty widely practice sport too, hardly niche. Lmfao... and he has about 300 needle marks in his arse to go with all those accolades. are you saying he's not full natty brah??? Based on what? (other than being Russian, admittedly). Read up on the guy and watch a few vids of him in action. He never looked juiced.